City Bank Latest Job Circular 2018 found here. 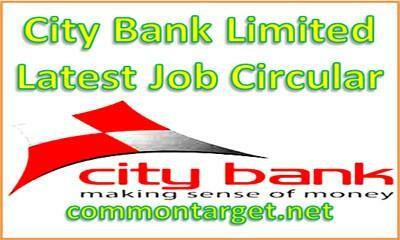 City Bank will recruit Various New Post for the year 2018 found updated here. City Bank New Job Circular 2018 published on different dates (See the Particular Job Circular for Details). Interested and eligible Bangladeshi Citizenship candidates are requested to Apply Online for the vacant positions. Deadline for Online Application on different dates (See the Particular Job Circular for Details). City Bank is one of the eldest Private Commercial Banks operating in Bangladesh. It is a topmost bank among the oldest five Commercial Banks in the country which started their operations in 1983. The Bank started its journey on 27th March 1983 by opening its first branch at B. B. Avenue Branch in the capital, Dhaka city. The bank currently has total 120 branches which include 99 online branches. It currently has 284 ATMs of its own; and ATM sharing arrangement with partner banks that has more than 1150 ATMs in place.